Sift flour, cocoa, baking soda and salt together on to waxed paper and set aside. Gently heat the chocolate chips over a double boiler, or in a saucepan set inside a larger pan with one inch of simmering water in the larger pan. When chocolate is melted, remove from heat and stir until smooth. Set aside. In an electric mixer, combine both sugars and butter and beat at medium speed. Add the eggs, one at a time, while still beating the mixture, and add the vanilla. Add the melted chocolate and beat just long enough to incorporate into mixture, and add dry ingredients. Fold in the chocolate chips. Cover bowl with plastic wrap and set aside for 30 minutes for ingredients to emulsify. 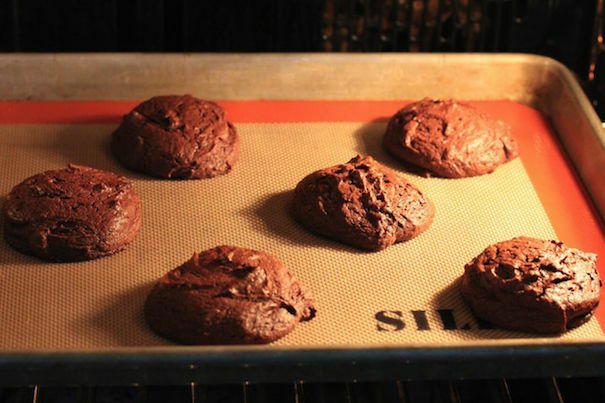 Allow cookies to cool 10 minutes, then dip half the cookie into the ganache frosting and allow to drain on a raised cooling rack. There is so much chocolate going on here that I didn’t dip every cookie, allowing for it to be enjoyed both with and without the ganache frosting. In a double boiler, mix the chocolate chips and whipping cream and allow to melt.